After an almost two-year journey through space, NASA’s asteroid sampling spacecraft, OSIRIS-REx, caught its first glimpse of asteroid Bennu last week and began the final approach toward its target. On Aug. 17, the spacecraft’s PolyCam camera obtained the image from a distance of 1.4 million miles. Led by the University of Arizona’s Lunar and Planetary Laboratory, OSIRIS-REx is NASA’s first mission to visit a near-Earth asteroid, survey the surface, collect a sample and deliver it safely back to Earth. The spacecraft has traveled approximately 1.1 billion miles since its Sept. 8, 2016 launch, and is scheduled to arrive at Bennu on Dec. 3. To boost itself onto Bennu’s orbital plane, OSIRIS-REx performed a slingshot maneuver, or gravity assist, around Earth 11 months ago. The craft is now zipping along at almost 32,000 mph relative to Earth, while catching up with Bennu at a little over 1,200 mph relative to the asteroid. The image was acquired using PolyCam, one of three cameras, all developed at the UA, that together comprise the OSIRIS-REx Camera Suite, OCAMS for short. As OSIRIS-REx approaches the asteroid, the spacecraft will use its science instruments to gather information about Bennu and prepare for arrival. In addition to the OCAMS camera suite, the spacecraft’s science payload includes the OTES thermal spectrometer, the OVIRS visible and infrared spectrometer, the OLA laser altimeter and the REXIS X-ray spectrometer. * Use OCAMS to reveal the asteroid’s overall shape in late October and begin detecting Bennu’s surface features in mid-November. After arrival at Bennu, the spacecraft will spend the first month performing flybys of Bennu’s north pole, equator and south pole, at distances ranging between 11.8 and 4.4 miles from the asteroid. 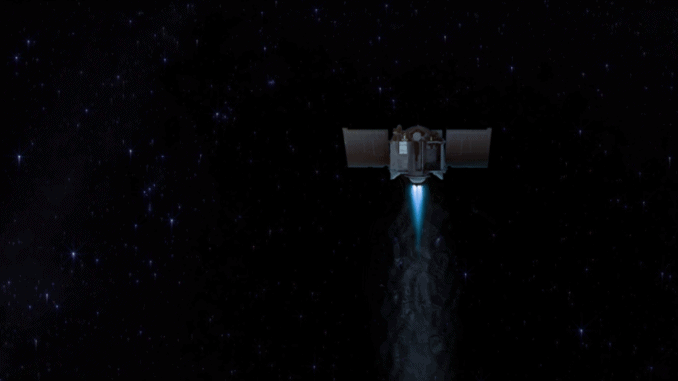 These maneuvers will allow for the first direct measurement of Bennu’s mass, as well as close-up observations of the surface. These trajectories will also provide the mission’s navigation team with experience navigating near the asteroid.